During an exciting Scholars Weekend 2013 at the National Conference Center in Leesburg, VA, Young Scholars had the opportunity to meet representatives from some of the country’s most prestigious colleges and universities. 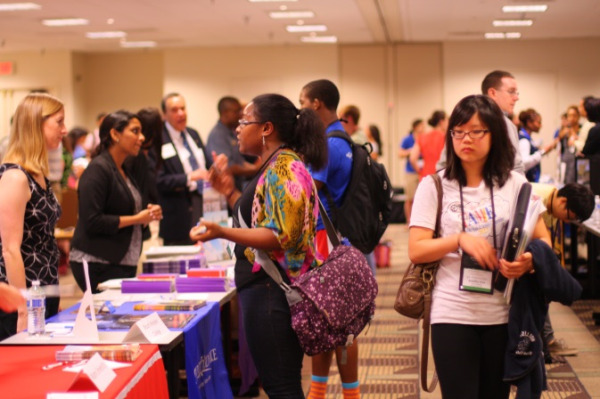 What made this a unique fair was that students first engaged selected college representatives in mock interviews. Once the interviews were finished, the representatives gave feedback and tips about the Scholars’ performance in the interviews. At the hour-long event, Scholars had a chance to learn more about the schools, to practice engaging with admissions representatives, and to figure out to which types of schools they were interested in applying. The Foundation encourages all students preparing to apply to college to take advantage of opportunities like college fairs. 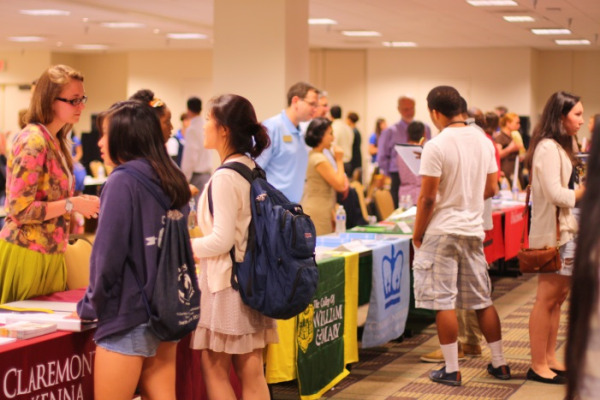 For suggestions about how to make the most out of a college fair or for ideas for other ways to demonstrate interest to admissions offices, visit our “Demonstrating Interest” resource page. 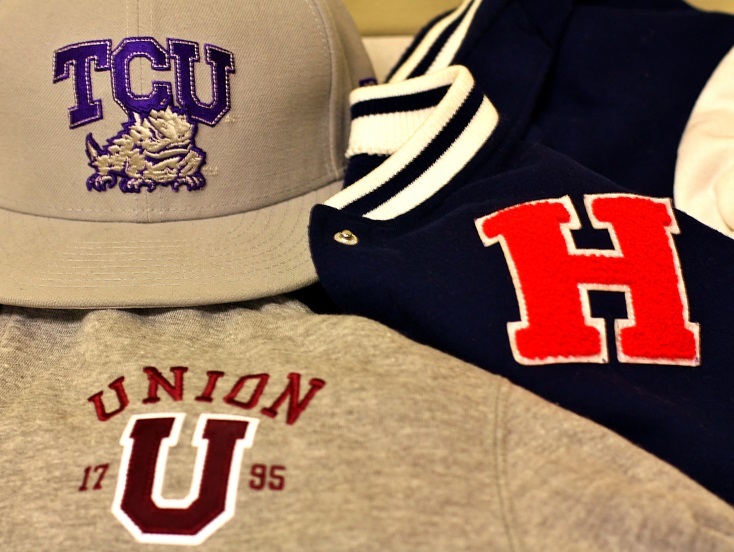 Be sure to check out the other tips from the Foundation about how to apply to selective colleges and universities. 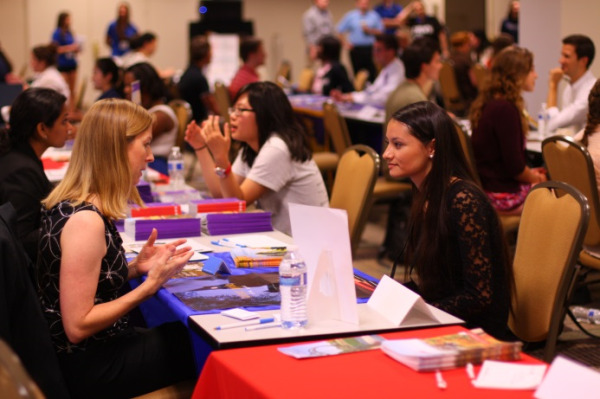 Representatives from nearly 60 colleges attended including Allegheny College, Amherst College, Barnard College, Bates College, Bennington College. Boston University, Brown University, Bucknell University, Carleton College, Carnegie Mellon, Claremont McKenna College, Colgate University, College of William and Mary, Columbia University, Dartmouth College, Davidson College, Dickinson College, Duke University, Elon University, Franklin and Marshall College, Georgetown University, Goucher College, Howard University, James Madison University, Lafayette College, Massachusetts Institute of Technology, McDaniel College, Miami University, Mount Holyoke College, New York University, Northeastern University, Northwestern University, Oberlin College, Pennsylvania State University—University Park, Pomona College, Sarah Lawrence College, Smith College, Spelman College, Stanford University, Swarthmore College, Syracuse University, The George Washington University, The Juilliard School, University of California at Berkeley, Union College, University of North Carolina at Chapel Hill, University of Pennsylvania, University of Maryland, University of Rochester, University of Virginia, University of Wisconsin at Madison, Wabash College, Wake Forest University, Washington and Lee University, Washington University in St. Louis, Wellesley College, Wesleyan University, Worcester Polytechnic Institute, and Yale University. Thanks to all who made the trip to Virginia to give this wonderful opportunity to our Young Scholars!